Led by Donhee Ham, Gordon McKay Professor of Electrical Engineering and Applied Physics at Harvard SEAS, and his student Dongwan Ha, Ph.D. '14, the team has dramatically shrunk the electronic spectrometer components, fitting them on a silicon chip smaller than a sesame seed. 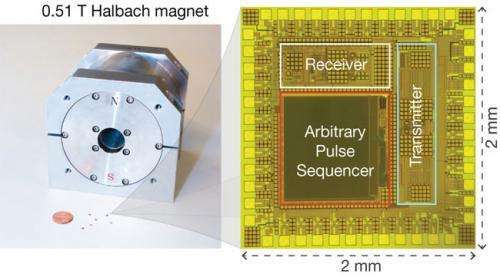 Combined with a compact permanent magnet, this minuscule spectrometer represents the smallest device that can presently perform multidimensional NMR spectroscopy—a process Ham calls "one of the most powerful analytical tools to determine molecular structures at atomic resolution." Significantly reducing both the size and cost of the device—while also preserving the broad functionality of much larger spectroscopy setups—now enables the development of portable NMR spectrometers that could travel to remote sites for online, on-demand applications or simply to laboratories where massive, state-of-the-art systems would be prohibitively expensive. The chips can also operate accurately over a wide temperature range. "State-of-the-art NMR systems use very large superconducting magnets, and they are indeed necessary for probing the structure of complex molecules like proteins," says Ham. "But in many circumstances—for example, many experiments in biochemistry or organic chemistry, quality control in production lines, or chemical reaction monitoring—you're doing NMR on smaller molecules, and for those applications the big superconducting magnets may be avoided." In comparison to superconducting magnets, however, permanent magnets are far less stable. With slight changes in temperature, the magnetic field fluctuates and drifts—a severe challenge that accompanies the system miniaturization. Ha, who is the main architect of the silicon spectrometer chip and lead author of the paper in PNAS, overcame the thermal problem with a distinctly modern tactic.